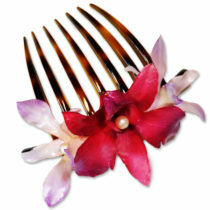 Description: Hair clip / magnetic brooch combo. Orchid(s) on a setting intended to be largely hidden by the flowers which overlap. Available in 6 colors, 3 sizes, and 2 settings. 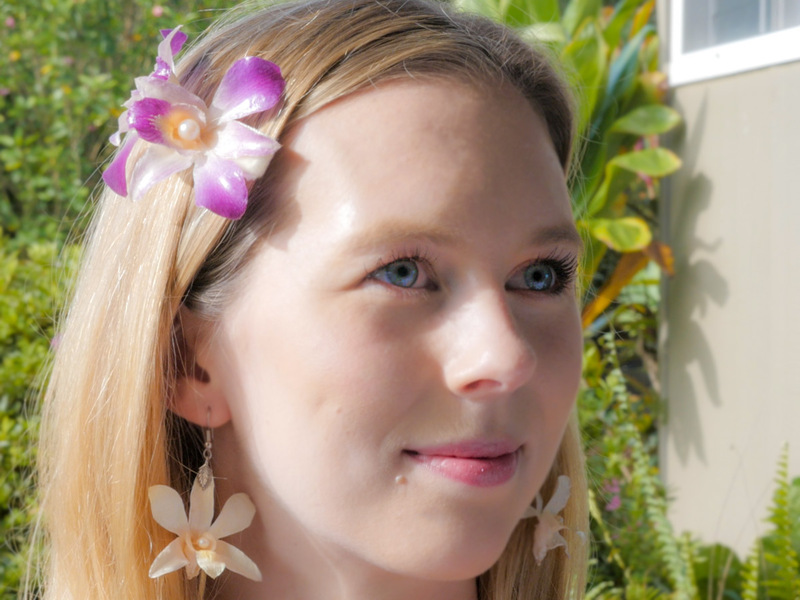 Real Flower Jewelry’s Hawaiian Orchid Combo is our newest, most sophisticated piece yet! The Hawaiian Orchid Combo merges the best features of the magnetic brooch and hair clip. 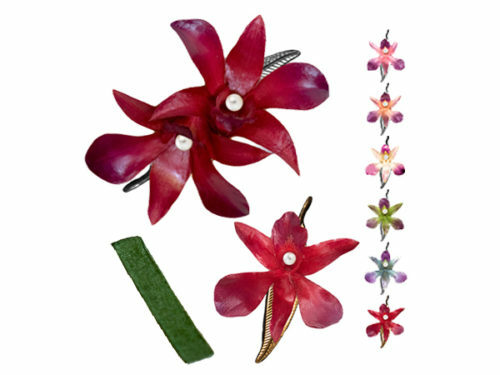 The orchid combo looks a lot like our brooch and hair clip, but the secret is underneath. 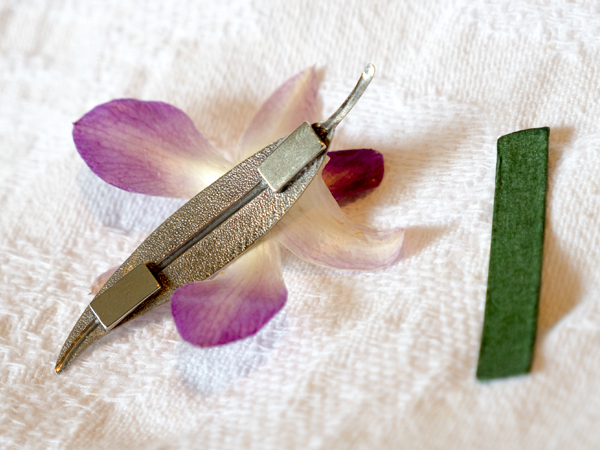 A non slip green strip perfectly holds onto hair or fabric, effectively combining two jewelry pieces into one. They make no holes in luxury or delicate fabrics or clothing. They are very easy to put on or take off – no difficult pinpoints, or bar pins. Ideal as gifts to those who are no longer nimble with their fingers, from injury, arthritis or rheumatism. Great for those whose eyesight has difficulty in seeing the detail of conventional safety catches. Lightweight – no drag on delicate clothing especially in warm climates. Tight grip – will not slip or slide on silk. 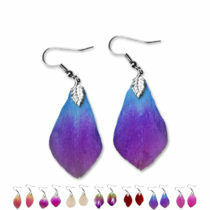 Designed to be worn on fabric as thick as the lapel of a jacket or coat. Our magnet brooches keep our jewelry tight and flat against the clothing. Will hold on lace, where otherwise the holes and delicate weave would prevent a conventional pin from sitting straight. Then place the combo over the position of the strip and the two will snap strongly into place. 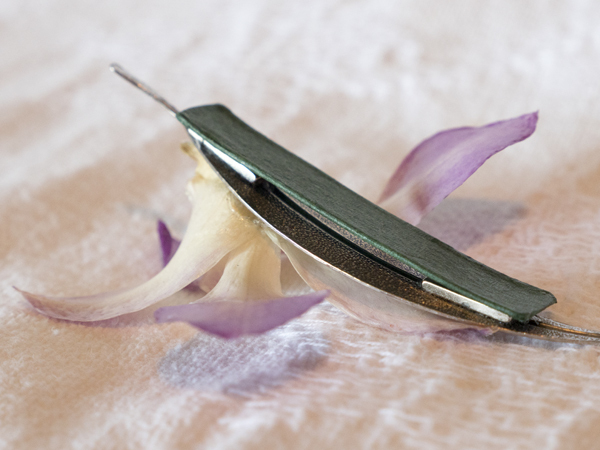 On removal, hold each of the two parts as before, and SLIDE them apart, – NEVER PULL! Our studios are strategically located right in the heart of the orchid growing area of The Orchid Isle. Aloha from the Big Island of Hawaii! Our creations use only the finest Hawaiian orchids. Each flower undergoes our exclusive and gentle preservative processes. 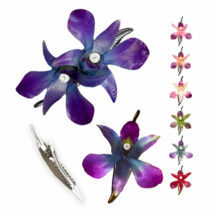 Our products are unlike any other – made with real flowers they are permanently durable, pliable and practical to wear. We use mostly dendrobium orchids largely due to their suitable size and strength. 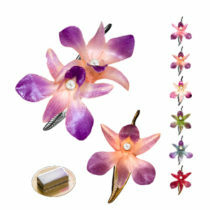 Our orchid items are not any conventional form of jewelry or accessory. With every flower item sold we provide guidelines on how to maintain them, keep them clean and best stored when not in use. Only handle orchid pieces by setting. Store separately and in original box.